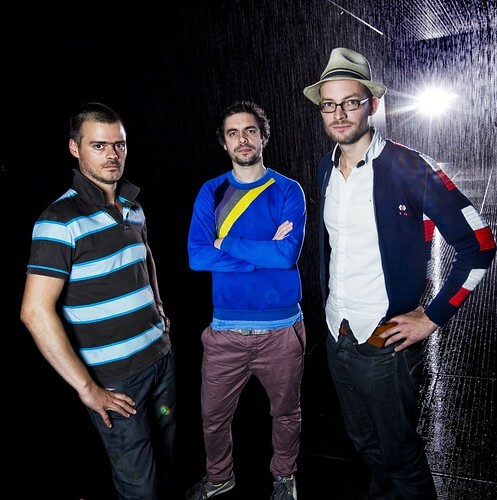 Random International’s Rain Room at the Barbican’s Curve gallery turns dodging the weather into digital spectacle. Technically speaking, Random International’s Rain Room involves few symptoms of rain, writes Sarah Handelman. There is no condensation. No clouds. No humidity. And, yes, that universal rain smell is also missing from the perpetual storm. But even from outside the door of the Barbican’s Curve Gallery, where the wait runs anywhere from 30 minutes to a couple of hours (warning: don’t visit during your lunch break), the temperature drops, you can hear the downpour and, if you pull your trench coat tight, you can prepare for it too. Top and right photographs © Felix Clay. Courtesy of Barbican Art Gallery. 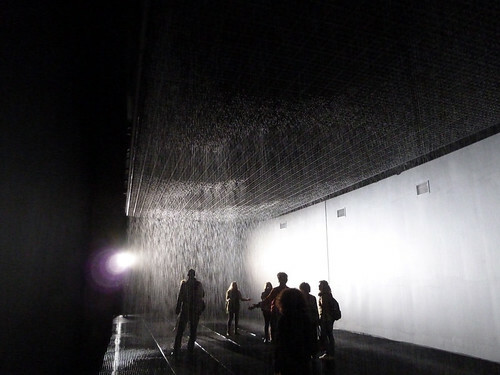 The latest installation by the technology-meets-psychology art and design group Random International, Rain Room may resemble London’s beloved rainfall only slightly, but it is true to its name: the work is a contained, 100-square-metre area of real, continuously falling water. Visitors can enter, walk around and leave without getting drenched. 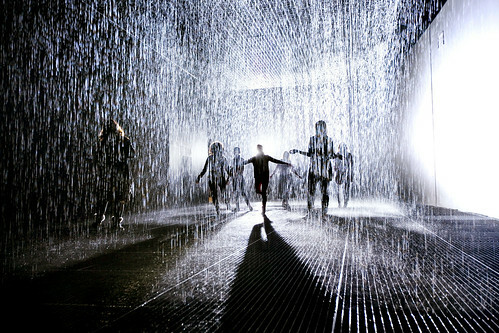 Rain Room by rAndom International. You can see a rainless ‘digital shadow’ of the participants in the overhead grid. Using tracking cameras, sensors and custom software, rAndom International has created a space where even the slightest movement can be detected: showers immediately cease wherever visitors choose to stand or move. One morning, daring children chased each other across the water while more cautious visitors ambled through the space – extending their arms in attempts to catch out-of-reach raindrops. Without even the splash of a residual rain-plop, you can stand in the middle of a confined storm and never become its victim. 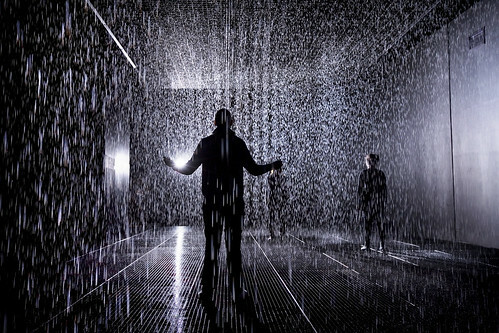 Rain Room gives the impression that you are controlling the weather, but Rain Room is also controlling you. rAndom International controls the waiting, the wondering and the wandering; the exhibition’s technological parameters dictate not only where you walk, but how: move too fast and you’ll be soaked. And the word ‘control’ is employed not only in relation to authority, but scientifically. 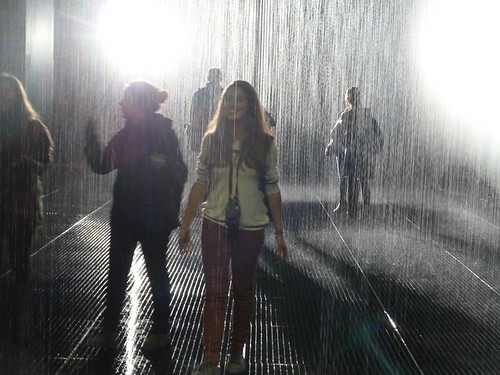 rAndom International often uses its projects to gather data for future research, and their installations are inherently tied to participant behaviour; Rain Room’s success comes from the willingness of visitors to step into a situation that goes against all logic. Photograph © Felix Clay. Courtesy of Barbican Art Gallery. 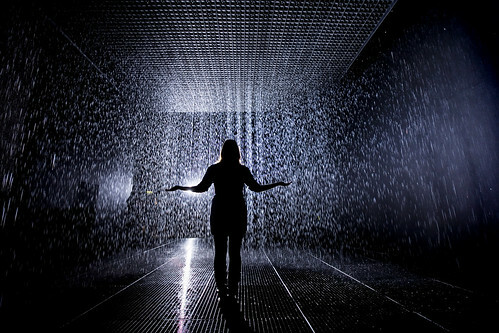 In Rain Room, light (and the lack of it) plays a vital role in not only showing but shaping expectations. Bright flood-beams illuminate waterless pathways made by those who step into the installation. In this way, the Curve work shares similarities with rAndom International’s Future Self, a dance work made earlier this year, which used choreographed movement to create a living sculpture from light. 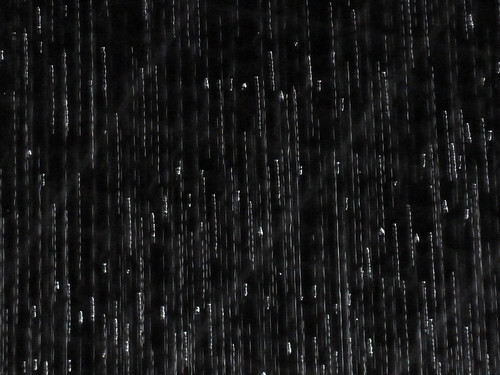 Here, however, light is not just a tool that creates the physical sculpture: once you are inside the downpour, Rain Room’s focused beams challenge perception on a fundamental level: suddenly, the raindrops don’t look like any raindrops you’ve seen before. Light refracts through their tiny, tear-shaped bodies, forming sharp and dangerous-looking prismic needles that bounce on to the grated floor and scatter into the black. Despite being in their line of fire, you are – thankfully – safe and dry. 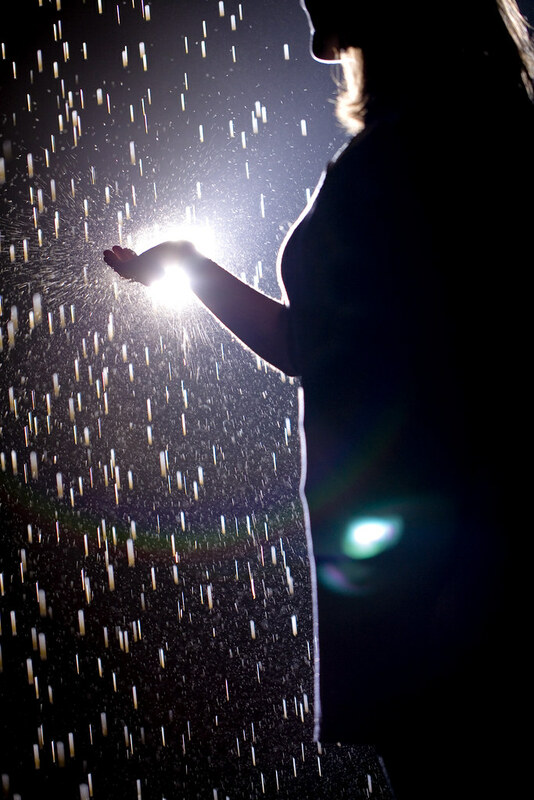 Still, this realisation deepens a desire to test Rain Room’s reality – to get drenched to confirm these raindrops are real. Considering the forecast for autumn, the constant queue for Rain Room is more than a little surprising. But the installation’s success isn’t because of what it can do; it’s what it makes you do. For once, leave the umbrella behind. Random International’s Rain Room at The Curve Gallery, Barbican.